The Monty Food Swap started as a monthly event in November 2010 and has met every month since, providing a place for gardeners to share their excess produce, information and questions, and building a friendly community of locals interested in learning more about home gardening. Come and join us for a celebratory morning tea and the usual food swap activities. 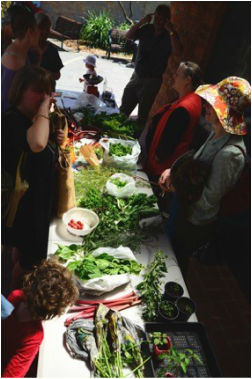 If you grow your own vegies & fruit, have chooks and have more produce than you need, come and swap with others at the Montmorency Food Swap. The Swap is held on the first Sunday of every month from 10:30am, in Were St for the warmer months, next to the Were Street Food Store. Winter time it's in the "Castle" at Montmorency Primary School. Compost, seedlings, preserves, cuttings, recipes are also welcome.